The prestigious awards ceremony celebrating the best in the food, drink and hospitality industry – MIDLANDS FOOD DRINK & HOSPITALITY AWARDS 2019, has gone from strength to strength since it’s inception in 2016, now in it’s 4th year it promises to be the biggest celebration ever. The ceremony has moved this year to Aston Villa – The Holte Suite and will take place on Monday 24th June 2019 with the usual prestige & glamour. With Pepsi Max as our headline sponsor for the fourth year running the event promises to be spectacular, capturing the vibrant industry which is full of flair, charisma and the most hard-working people in any industry. This year there have been some new additions to the awards categories. In addition to these the Spanish category has been widened to include food from the broader Hispanic countries, therefore this category has been re-named to Hispanic restaurant of the Year. The MFDH Awards aims to recognise and reward all the amazing attractions from bars to restaurants to cafes and more which are pushing the envelope through first rate menus, creative settings and stellar service. Given that it’s one of the most culturally rich regions in England, it’s only natural for the food, drink and hotels of the Midlands to be as equally diverse and unique. In fact, it is the success of our thriving food, drink and hospitality establishments in places like Birmingham, Wolverhampton, Leicester, Coventry and Nottingham that has helped to make the Midlands the great place that it is! The awards will be judged by independent judges who have direct knowledge and experience of the Food, drink & hospitality industries. There is an additional process of a public vote which will also be considered in the final decision making by the judges. ….But, first of all we need your nominations, so get nominating now, visit our website www.mfdhawards.co.uk and nominate your favourite, or if you are part of the industry and believe you deserve to be nominated then you can nominate yourself. 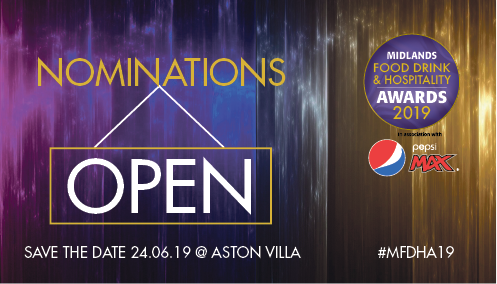 Shortlist will be announced on the 6th May 2019 when voting will also commence. We look forward to receiving the nominations……… Good luck! Next:PEPSI MAX DO IT AGAIN!